Our client is currently holding a Dynamics CRM Development Lead position (Dynamics 365) for a Developer Guru to head up their global development team, contributing to our growing success. If you dream of running an international distributed development team; if you have a desire to work hand in hand with C-level management, if you like a flat organization where your opinion matters and your contributions are appreciated. NOTE: Applicants must be eligible to work in the US or CANADA. 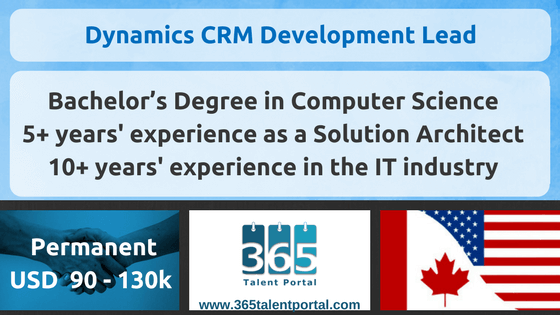 For more Microsoft Dynamics positions please register with 365 Talent Portal. About us: 365 Talent Portal is the first online platform that gives Dynamics partners and end-users instant access to hundreds of consultants. With a network spanning 101 countries, it allows companies to search for consultants based on their skills, rates and available dates, enabling them to find the best person for their positions without incurring the hefty fees typical of recruitment agencies. Register here –www.365talentportal.com.